The Heritage City in Northern of Laos. 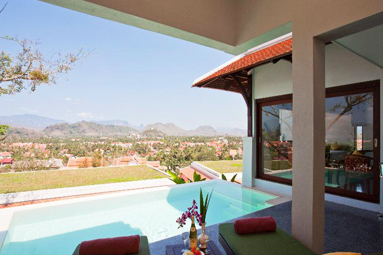 It boasts breathtaking with panoramic views of the countryside valley. The hotel’s construction began in 2007. It was a multi millio dollars project which took three years to complete. This truly magnificent hotel was restored to its original splendor and is easily among the best one can expect in this world Heritage City. 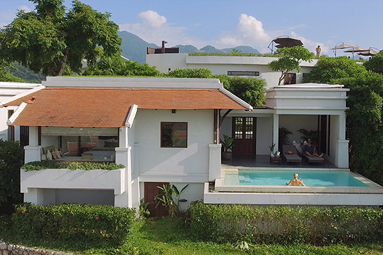 Restoration work was guided by the renowned local exterior designer Mr. Boun Kham and the interior was designed by Mr. Ewan. Innovative and traditional colorful designs were used to restore entire rooms, right down to the finer detailing in draperies, ceilings, teak wood floors and murals. 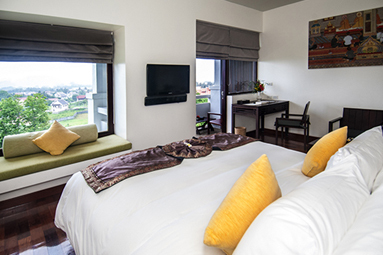 Today, each category of the rooms represents a myriad of cultures and eras. The public areas available for viewing provide a glimpse of the rich history of the building. The Terrace Cafe & Bar dishes up a casual, all-day, indoor and outdoor dining experience. Enjoy a selection of French-inﬂuenced pastries and cakes from the bakery or a choice of light snacks, while pondering the beauty of the surrounding countryside. 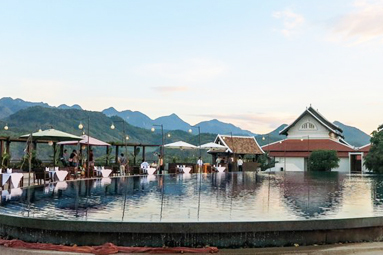 The Café Bar’s coffee is brewed from locally sourced beans harvested from sustainable plantations, while expert mixologists prepare the perfect cocktail to sip while watching the sun set over Luang Prabang. Perched on the highest point, of the property and the city, with an unbeatable 360-degree vista, The Skyy Lounge offers a variety of food and snacks alongside drinks, cocktails, and cold beer. Many guests opt for the romantic set menu or selections from the a ‘la carte slate alongside an inspiring wine list. 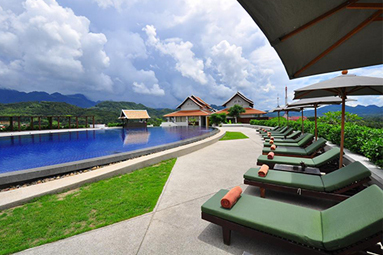 However, the Skyy Lounge’s main attraction remains the evening view of the serene countryside and mountain valley. Whether you want to dine in air-conditioned splendor or outside at a table in the breeze, the Som View Restaurant presents a distinct gourmet dining experience. 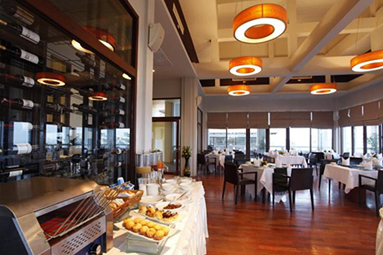 A striking breakfast buffet allows diners to engage with the chefs over the meal. Lunchtime diners can muse over an a la cart menu, while the dinner crowd can ponder a more sophisticated selection of dishes with a palate-pleasing wine list. 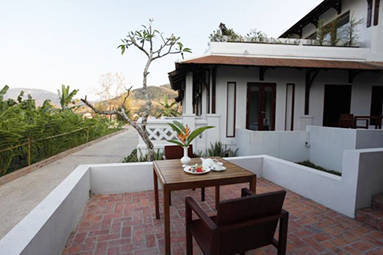 Our green concept for the hotel: Luang Prabang View Hotel grows and cultivates a lot of flowers, plants and vegetables from its own gardens and nursery. Fresh herbs, bananas and fruit trees are abundant around the hotel, while perennial flowers help the hotel keep costs down. The nursery supplies cuttings for the hotel, and recycling ponds for rain water. The hotel has a recycling program for paper, cardboard, glass, plastic and other products that can be sold or re- used. 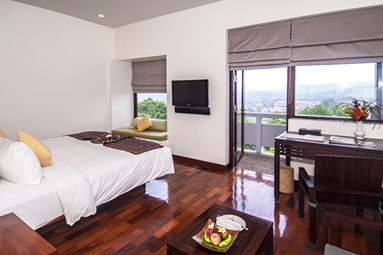 Don’t forget the roofs of most guest rooms are covered in lawn to keep the rooms nice and cold, this reduces the use of air-conditioning. Gardening water is from the recycling ponds.